Due to this Sky Sports article, featuring an alleged picture of Andrey Kuznetsov when it is, in fact, a picture of Alex Kuznetsov, I’m guessing a primer is in order on how to properly differentiate the two. Alex Kuznetsov is a 24-year-old American tennis player, currently ranked #199 in the world. A former Top Ten junior, AlKuz was once on the fast track, working out with Andy Roddick and attending Miami Heat games with RAndy, Mandy (Moore) and Roddick’s then-coach Brad Gilbert. For those with long memories, you might also recall him as a hitting partner with that year’s US Davis Cup team. Unfortunately, fate found Alex a quick and cruel exit off the fast track, in the form of a single car collision with a tree that sent him straight into surgery with a broken right thigh. A titanium rod was inserted in his leg, and the promising player was off the courts for three months afterward. He was still able to team up with Scott Oudsema to win a round in the US Open dubs just four months after that, and he made it to the third round of the USO juniors that year (where he was beaten by Tim Smyczek). Sadly, after that quick recovery, Alex found it hard to recapture his once-promising form. One year later, after winning one challenger but struggling otherwise, he got a WC to the USO main draw where he was ever-so-ironically defeated in the first round by Tommy Haas, who knows a few things about coming back from leg injuries. These days, Alex is again on the rise, attaining a high of 158 just a couple of weeks ago. He made the finals of the Honolulu Challenger in January (losing to Ryan Harrison) and the semis of the Dallas Challenger last month. 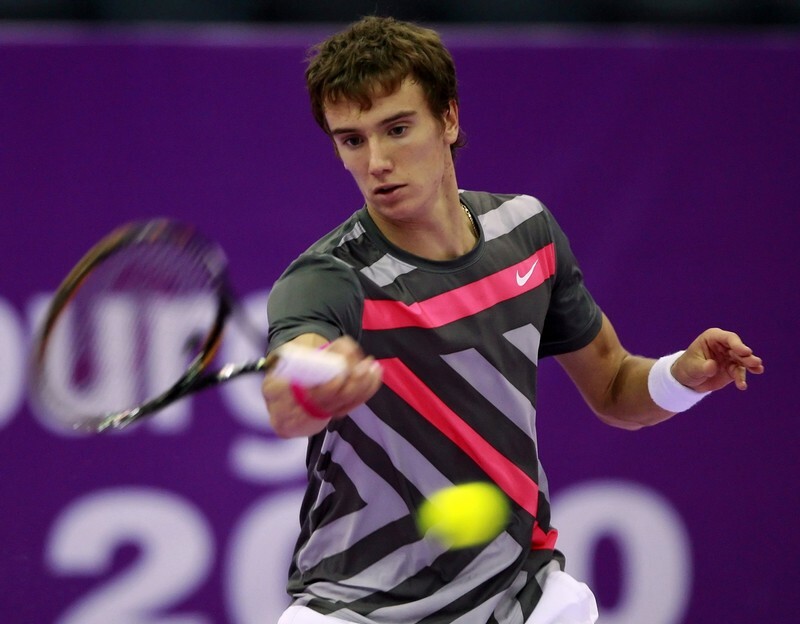 Andrey Kuznetsov is a 20-year-old Russian tennis player, currently ranked #244, with a high of 163 (last August). He is one of my 2011 Challenger Tennis Players To Watch (the first, in fact), and – since I’m too lazy to cut and paste my material – everything you ever wanted to know about him, words and pictures, audio and video can be found here. The short version, in case you’re too lazy to click: he won junior Wimbledon. Since I wrote the above-linked profile, he’s had just an OK year, going 9/5 and only really catching fire in Casablanca with today’s win over second seed Marcos Baghdatis. Now, I’ll grant the good people of Sky Sports this: while Andrey was winning the juniors at Britain’s prestigious “W” tourney (hint: Wimbledon), on this side of the pond Alex was winning ours. That’s right: he won the Winnetka Challenger that very same week, unseeded, beating a top seed along the way – just like Andrey did! So maybe they were thinking of that. Yeah, I’m sure that’s it. Could happen to anyone. Plus they’re both brunettes. With birthdays in February. Anywho, I’ll be watching Alex at the Tallahassee Challenger next week in case more photographic evidence is needed for this study. In the meantime, feel free to review this lesson as much as is helpful. There might be an exam.